Business travel is taxing. It pays to get it right. Whether or not you’re the person directly in charge of booking every detail, it’s inevitable that plans change and last-minute decisions have to be made. meets the needs of both you and the business – work with whoever books business travel in your company to come up with a robust policy and booking templates. By providing this input, you’ll not only help streamline the process, it’ll serve to make your life easier – and your business travel a more comfortable, stress-free experience. 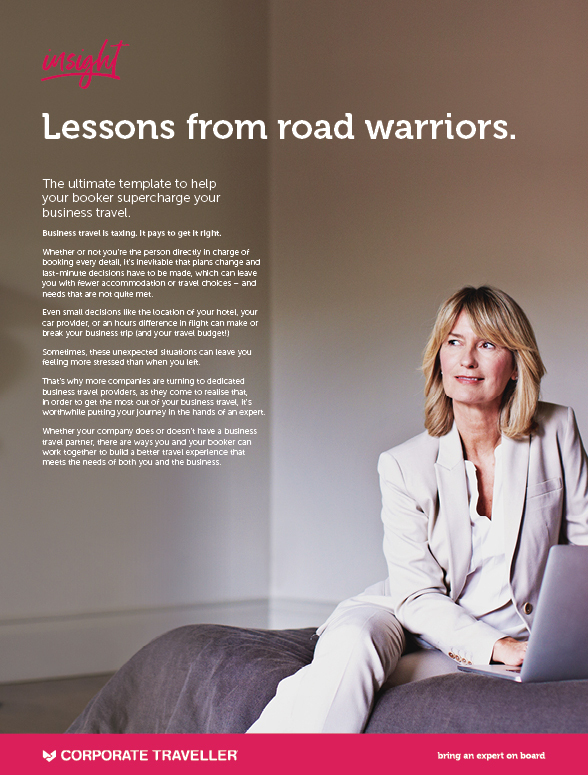 Download our eBook ‘Lessons from road warriors: The ultimate template to help your booker supercharge your business travel’ now and help make your next business trip simpler, faster and easier.